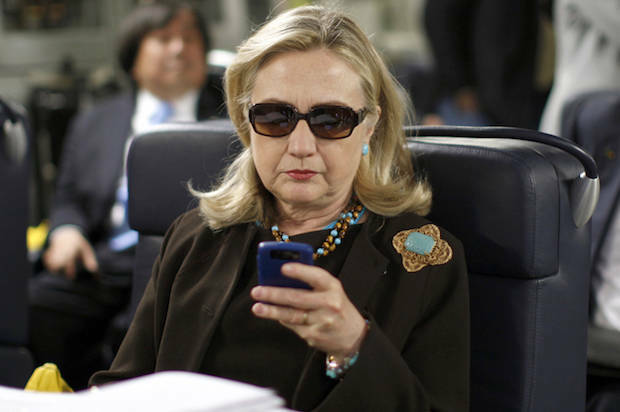 FBI CRIMINAL INVESTIGATION EMAILS: CLINTON APPROVED CIA DRONE ASSASSINATIONS WITH HER CELLPHONE, REPORT SAYS | "Global Possibilities"
U.S. Secretary of State Hillary Clinton checks her PDA upon her departure in a military C-17 plane from Malta bound for Tripoli, Libya October 18, 2011. Under Sec. Clinton, State Department officials approved almost every single proposed CIA drone assassination. They only objected to only one or two attacks. The U.S. drone program has killed hundreds of civilians in Pakistan, Yemen, Somalia, Afghanistan and more. The Wall Street Journal report provides more insight into the State Department’s coordination with the CIA on the secretive drone program. State Department officials were given notice before a planned attack, sometimes with a narrow timeframe of as few as 30 minutes. Officials told the FBI that they used a less-secure system of communication when they had to make a decision quickly before a drone killing and were not at the office. Roughly half a dozen times, State Department officials sent emails on their smartphones in order to approve a drone assassination when they were away from secure communications systems. The U.S. is very secretive about its covert CIA drone campaign. Strict U.S. classification rules bar officials from discussing drone killings publicly and outside of secure communications systems. Given this secrecy, law-enforcement and intelligence officials told the Journal that State Department discussion of the covert CIA drone program should have been conducted via a more secure communications system. The criminal investigation into Clinton’s emails has often been a right-wing talking point, but the scandal has much wider implications. “It’s acceptable to mishandle classified info on your bathroom server and share classified info with your mistress, just don’t blow any whistles,” he quipped, referencing the fact that the Obama administration has waged an unprecedentedly harsh crackdown down on whistleblowers. The FBI is expected to interview Clinton this summer about the scandal. Law-enforcement officials told the Journal they don’t think criminal charges will be filed against her after the investigation. Clinton herself has repeatedly confidently insisted that she is not going to be charged. State Department spokesman Mark Toner refused to speak about the emails or the investigation. Qualified under the Constitution to be POTUS if elected. Sure. Just as I am as an American. However the drone program is an act of aggression in another country. If a bloody job and bloody work is to be done it must have Constitutionally a formal declaration by Congress to do so and not a bad Act accepted by resolution. The SOS and POTUS should have been both been impeached as well as predecessors for failure to follow Constitutional law. No one is above the law and the public should have had a revolt a long time ago over this. I watched outrage against one POTUS as well by his forgiving by pardon a predecessor.